It has been a good year for new fossil taxa on this blog. 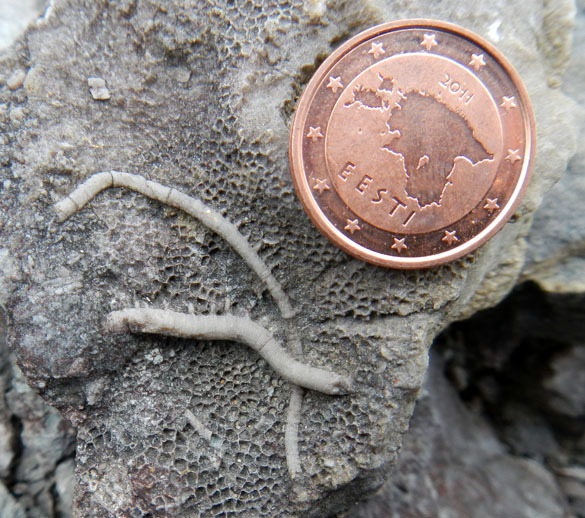 I’m pleased to present a fauna of Early Silurian crinoids from the Hilliste Formation (Rhuddanian) exposed on Hiiumaa Island, western Estonia. They are described in a paper that has just appeared in the Journal of Paleontology (early view) written by that master of Silurian crinoids, Bill Ausich of Ohio State University, and me, his apprentice. Here’s the simplified caption for the above composite image: Rhuddanian crinoids from western Estonia: (1) Bedding surface comprised primarily of crinoid columnals and pluricolumnals; (2) Radial circlet of an unrecognizable calceocrinid; (3) Basal circlet of an unrecognizable calceocrinid; (4) Holdfast A: Virgate radices anchored in coarse skeletal debris; (5) Holdfast D: Simple discoidal holdfast cemented to a bryozoan; (6, 7, 8) Hiiumaacrinus vinni n. gen. and n. sp. : 6, D-ray lateral view of calyx, 7, E-ray lateral view of calyx, 8, basal view of calyx; (9) Holdfast B: Dendritic holdfast in coarse skeletal debris; (10) Eomyelodactylus sp. columnal; (11) Holdfast C: Simple discoidal holdfast cemented to a tabulate coral; (12) Two examples of Holdfast E: Stoloniferous holdfasts cemented to a tabulate coral; (13) Protaxocrinus estoniensis n. sp. lateral view of partial crown, top of radial plate indicated by line. 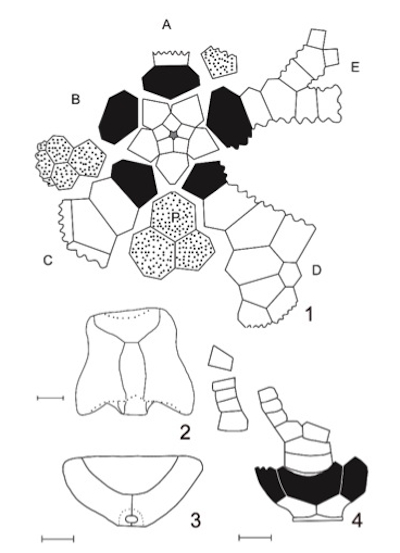 No crinoid paper is complete without camera lucida drawings (scale bar for all figures is one mm): (1) Hiiumaacrinus vinni n. gen. and n. sp. ; (2) Radial circlet of an unrecognizable calceocrinid; (3) Basal circlet of an unrecognizable calceocrinid; (4) Protaxocrinus estoniensis n. sp. There are two new species and one new genus here. 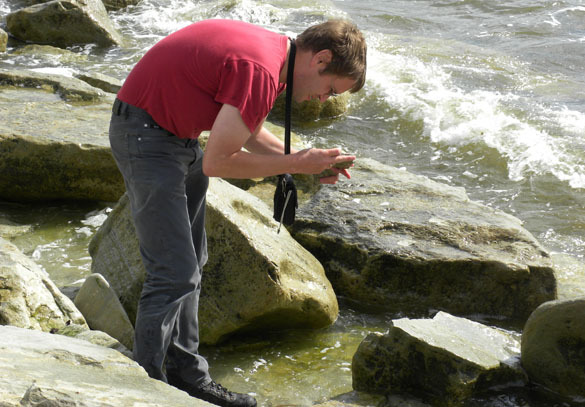 Hiiumaacrinus vinni is named first after the lovely Estonian island where the species is found, and then after our good friend and colleague Olev Vinn (above) at the University of Tartu. Olev first introduced me to the Ordovician and Silurian of Estonia, and then was an excellent field companion for Bill and me on our Estonian field trips. 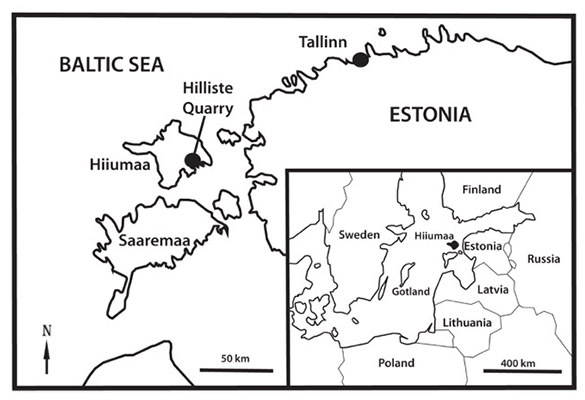 A reminder where Hiiumaa Island is, and for that matter, the nation of Estonia. 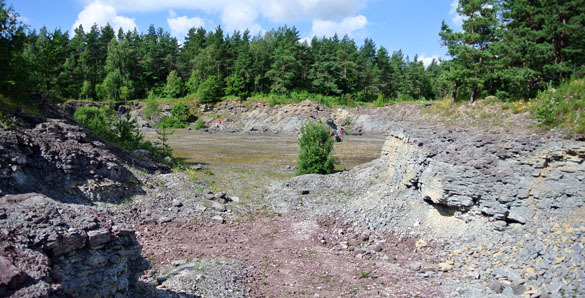 Here is Hilliste Quarry on Hiiumaa Island. Still one of my favorite places to work. Very, very quiet. Here is Bill Ausich in the quarry during our 2012 expedition. The pose is known among paleontologists as “the Walcott“. Here is one of the specimens collected by Bill in July of 2012. You may recognize this field scene as figure 12 in the top image of this post. These are two examples of crinoid holdfasts on a tabulate coral. Please welcome Hiiumaacrinus vinni and Protaxocrinus estoniensis to the paleontological world! Ausich, W.I. and Wilson, M.A. 2016. Llandovery (Early Silurian) crinoids from Hiiumaa Island, Estonia. Journal of Paleontology (early view). Ausich, W.I., Wilson, M.A. and Vinn, O. 2012. Crinoids from the Silurian of Western Estonia (Phylum Echinodermata). Acta Palaeontologica Polonica 57: 613‒631. Ausich, W.I., Wilson, M.A. and Vinn, O. 2015. Wenlock and Pridoli (Silurian) crinoids from Saaremaa, western Estonia (Phylum Echinodermata). 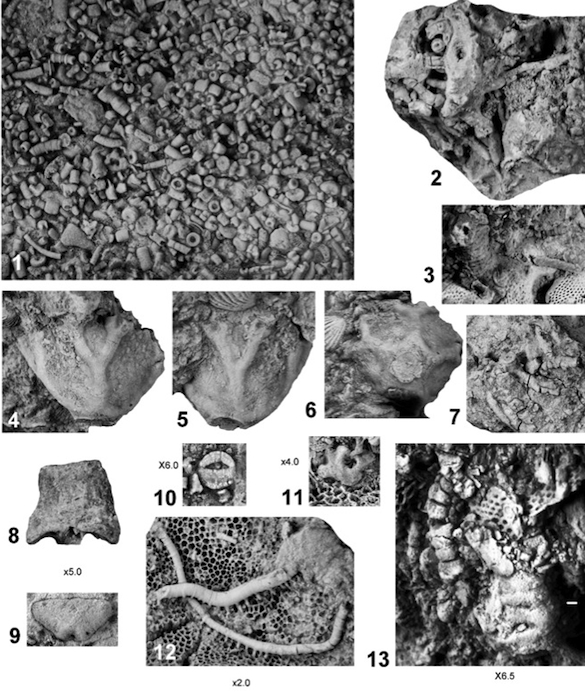 Journal of Paleontology 89: 72‒81.